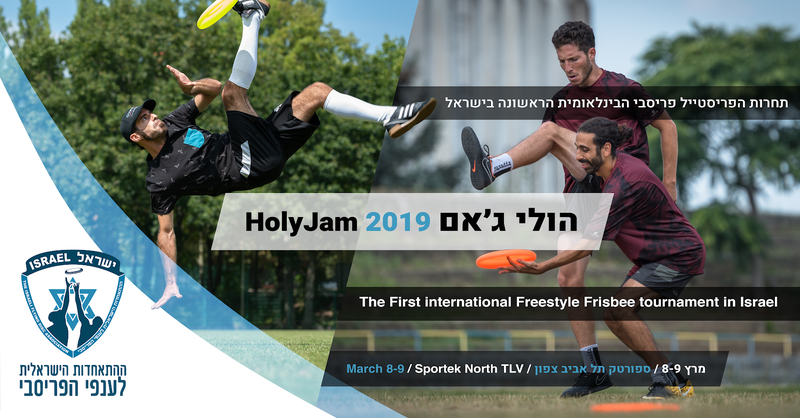 We are very happy to invite you to The first international Freestyle Frisbee tournament in Israel – HolyJam 2019! The event will take place during the weekend of march 8-10 (a week after Frisbeer in Prague – come to both and double the fun! ), a detailed schedule will be posted soon. Tel Aviv is one of the most vibrant cities in the world, titled the ‘Mediterranean Capital of Cool’ by the New York Times, this is a 24 hour city with a unique pulse, combining sandy Mediterranean beaches with a world-class nightlife, a buzzing cultural scene, incredible food, UNESCO recognized architecture, and an international outlook. The event will be held at the Tel Aviv’s main park called “Ganey Yehosha”/ “Ha-Yarkon Park”, at the sports zone of “Sportek North”. The field is located in the middle of a big grass area of 160 x 160 meters (~175 x 175 yards) with a nice breeze coming from the sea (found less than a mile away). The site is within a walking distance from a wide range of restaurants and shops, a big parking lot can be found next to the field and there are a few bus stations around the park connecting various bus lines from and to different parts of the city. Besides of the field, different backup gym options are being studied. A provisional online map can be found in the next link: https://tinyurl.com/HolyJam2019map. Besides Google Maps, which has a great coverage of Israel, the Israeli free GPS navigation app Waze offers real-time traffic information. We also recommend to get the maps.me app and download Tel Aviv’s map for offline navigation. If you’re more of an old-school navigator, road maps are widely available in Israel, many of them can be found in English and other languages. The closest international airport is Ben Gurion Airport (TLV), located 29km (18 miles) from the event’s site. Many international airlines have regular direct flights to TLV. If you plan on coming after Frisbeer (highly recommended! ), make sure to book your flights now, as prices are still pretty cheap (some jammers have reported finding round trip tickets for a less than 120 euros!). Arriving from the airport to the city can be easily done by taking a short train ride (costs around 4-5 euros) or a taxi (costs around 35-60 euros). Hotels – there are hundreds of hotels in Tel Aviv (the nearest are found a km away from the field). Depending on quality and luxury levels, prices per person/night start around 50$-80$. Hostels – many can be found in Tel Aviv, these cost around 40$-60$ per person/night. variety to choose from, prices per person/night start around 20$-30$ when shared with more guests. Other options – we are trying to get special deals and discounts for offering more options, we will keep you updated. If you already know what you’re looking for, please don’t wait for us, reserve your accommodation as soon as possible. Water and food arrangements for players will provided, we already started looking into catering options and other possibilities, more information will soon be added. Regardless, water fountains can be found around the field and a there is a small kiosk next by. We are working on very cool options, more information will be added soon. Geography – Israel is a small, narrow, semi-arid country on the southeastern coastline of the Mediterranean Sea, the total area of the State of Israel is 470 km (290 miles) in length and about 135 km (85 miles) across at the widest point. The country is bordered by Lebanon to the north, Syria to the northeast, Jordan to the east, Egypt to the southwest and the Mediterranean Sea to the west. Mountains and plains, fertile land, and desert are often minutes apart. The width of the country, from the Mediterranean Sea in the west to the Dead Sea in the east, can be crossed by car in about 90 minutes; and the trip from Metulla, in the far North, to Eilat at the country’s southern tip takes about nine hours. Climate – Israel’s climate is great, with an average of 26 °C (79 °F) in the summer and 14 °C (57 °F) in the winter. In march we should have very pleasant daytime temperatures at around 15-25 °C (60-70 °F). Language – Hebrew and Arabic are official; English is widely spoken and other languages like French, Hungarian, Polish, Russian, Spanish and Yiddish can be sometimes heard. Currency – The local coin is the New Israeli Shekel (NIS/₪) – 100 Agorot make up 1 Shekel. Prices – Israel is not the cheapest country in the world and you should expect Western European prices, here are a few examples (all in NIS): ⅓ litre beer in a bar – around 28 (around 10 in a supermarket), a cup of coffee – 10-15, a meal at a restaurant – 50-100 (fast food – 20-40). Safety in Israel – Is Israel safe? YES is the simple answer. As much as we can say, anywhere is safe. There are two aspects to safety in Israel, first, in terms of national safety, Israel is a very developed country, which exercises very strong security measures, in the last years, the amount of terrorist attacks in Israel have reduced dramatically, especially in the cities. Due to the location specificity, some parts of Israel is better to avoid – The West Bank (Bethlehem, Jericho, Ramallah), parts of Golan Heights (east of the route 98) are supposed to be risky, and we highly recommend refraining from visiting the areas within 5 km of the border with Gaza as well. Most of the mentioned zones are located far from Tel Aviv, and accidentally visiting them is impossible. In terms of personal safety, the crime rate, especially violent and extreme crime, is much lower in Israeli cities than in cities in the US and Europe, for example, it is actually safe for women to walk alone at night in most places. Visa – In general, holders of normal passports of European Union countries, the United States and many other countries, won’t be required to have a visa for visiting Israel for tourism, as Israel has visa exemption agreements with more than 100 jurisdictions (for a maximum stay of 3 months), please check your country’s policy. Health – No immunizations are required for visiting Israel. Health facilities are widely available across the country, with many hospitals being global leaders! Doctors are also widely available and a high proportion of them speak very good English. The biggest health risk when visiting Israel, like in any other hot climate countries, is the sun, so make sure you take precautions to protect yourself. Water – Tap water is safe to drink across Israel, although bottled water is widely available as an alternative. Electricity – 220 volts AC, 50 cycles, usually triple-pinned. European double-pin plugs should work, an adaptor is required for devices from other origins. Cell Phones in Israel – Most international cell phones will work in Israel, although it is often worth buying a local sim card (even if it is just for data) as this reduces the cost significantly. Internet Access/Wifi in Israel – Israel is technologically advanced, wireless networks can be found up and down the country, everywhere from restaurants and cafes, hotels, to train stations and Ben Gurion Airport. The standard rate for wi-fi in Israel is between 10 and 15 Shekels per hour. However, free wifi is available in many places, just ask the staff for the password and they will happily give it to you, you might even find free wifi spots provided by the municipality in some parts of big cities. Religion – Around ¾ of Israel’s population is Jewish (of which most are on secular-traditional spectrum), around ⅕ is Muslims, while the rest of the population is made of Christians, Druzes, Bahá’í’s and other religions and beliefs. Shabbat/Saturdays – Shabbat is the jewish holy rest day, it begins on Friday evening and continues until Saturday evening. During the Shabbat most businesses in Israel don’t work (just like Sunday in western countries). Traveling is harder, as public transport during the Shabbat is very limited. Trains and buses don’t operate at all, this reduces the options to taxi, “sherut-taxi” (a shared taxi, typically a minivan, following buses lines) or hiring a car (which should be rented ahead as it can’t be collected or returned during the Shabbat). Sunday, on the other hand, is the first day of the week, just like Monday in western countries.